Back at the beginning of July Ga-Ga & Pa took the kids home with them after church. The kids were actually stay there for a total of 11 days! Michael and I came down for the 4th of July and then I stayed there since family was flying in from Wyoming. More on that in another post! Whenever my parents take the kids home from church, Michael and I use the rest of Sunday as a date day. We usually head to Kent Station for lunch...on this day we ate at Mama Stortini's. I was so shocked that Michael even wanted to eat there...he doesn't normally like it. I think this time he had Sunday brunch and he did actually enjoy it. Since this was the Sunday prior to the 4th of July Value Village was having a 50% off sale that day. I didn't really need new clothes since we've gone to Value Village quite a lot this year, but I had just recently started liking dresses and I'd never really spend a good amount of time looking at dress at Value Village. 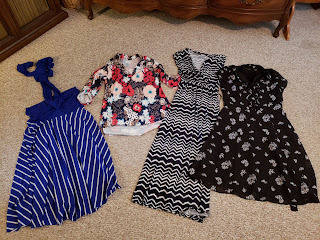 I have bought a couple over the years, but just when I absolutely needed a dress. Michael obliged me, but I could tell I had reached his max amount of time for shopping for the year so I better make it quick. When we walked in I encouraged him to stop and look at dress shirts since he didn't have much luck with short sleeve shirts the last time we'd gone. He did end up finding 4, but something I realized later is I really need to have him first...try them on in front of me...sometimes they are too big and secondly...look them over for tears or stains. 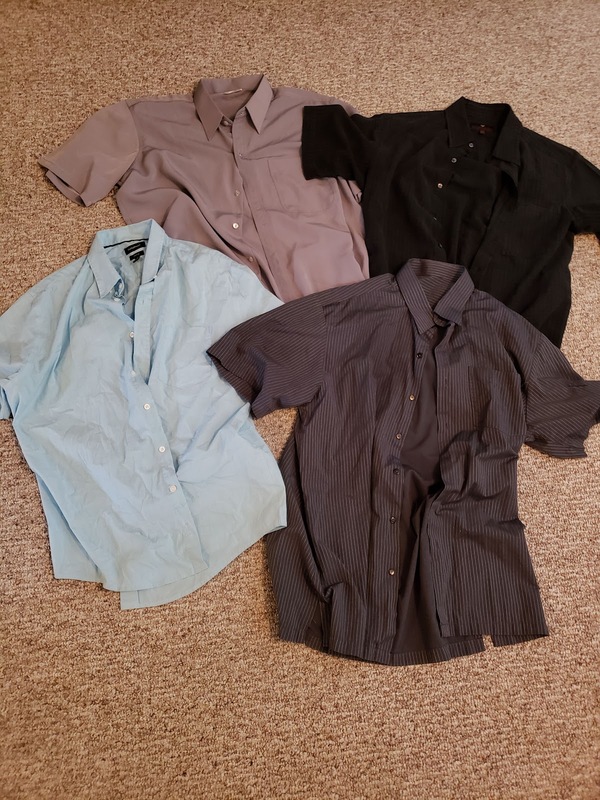 One of these shirts ended up having a tear on the arm and it was a really nice shirt. Total bummer! As for me...I hit the jackpot with dresses and one shirt! Going left to right...the blue striped one is not something I would normally try on, but it was just so vibrant. It's actually a halter top dress. It's a great length and it's so comfy and soft like a T-shirt. The dress shirt next to it was a total impulse buy. We were standing in the checkout and I saw it on the rack and again the colors were so vibrant. Michael didn't want to have to wait again for me to try clothes on so he said..."Just buy it, if it doesn't fit you can take it back". It's got a definite Japanese flair with the way the collar is and I get compliments anytime I wear it. The next dress is super comfy and has cute cap sleeves. I'm not normally a sleeveless girl, but this covers just enough of my shoulders I feel comfortable. Plus the length is longer and I'd been wanting a good long dress. The next one I actually completely missed when trying on all the dresses. It had gotten buried in the cart! When I was pulled clothes out to buy them I just decided to hope for the best and it turned out great. This dress actually ended up being Michael's favorite. The black and blue ones isn't my favorite, but I still think it's super cute. I will definitely wear it to church, but it's not an all day kind of dress. I was really excited about two maxi dresses. 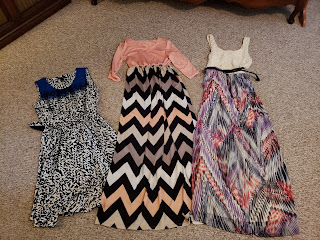 I have wanting a maxi for years, but I had never found any that were the right length. Normally they are too maxi and I would need to hem them. I love chevron patterns and that coral color. 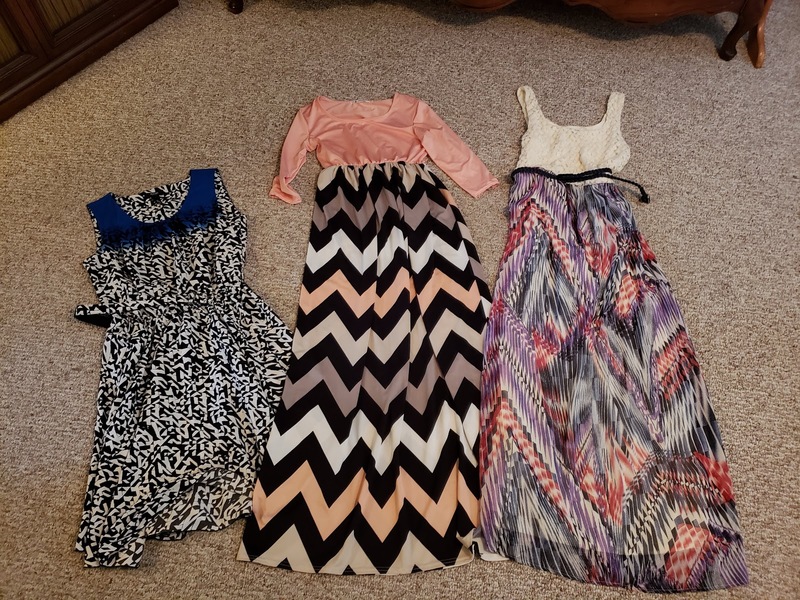 The one on the right is cream on the top with a fun lace pattern. It also still had the original price tag on it...of course the actual price part had been ripped off, but $7 for a dress is amazing. I have worn this one once already and I paired it with a sweater while I was at work since the whole not super into sleeveless thing. The last two need some minor sewing work. 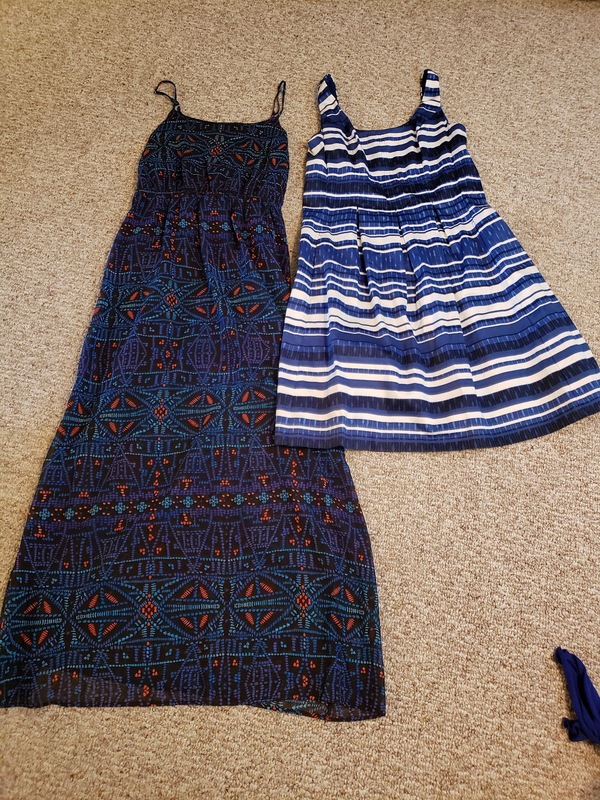 The one on the left has a super cute fit to it. It's also has that see through look from the knees down. The only thing is the fit under one arm is a bit funny. After further investigation it looks like someone actually altered this so it would fit tighter under the arms, but some of the stitching has come out. So I'm just going to restitch it and it will be perfect. This next dress is so cute. Perfect length...at the knees and it has pockets. The only thing is the stitching in the front makes me look like Madonna...too pointy if you know what I mean. So I'm going to do a couple stitches on either side that will fit that right up. Now I just have to find the time to actual do that. On the day that Kim and I went strawberry picking she told me about imperfect produce. I had been seeing advertisements for it as well and was curious. She sent me an email that gave me $10 off my first order so I thought I'd give it a try. 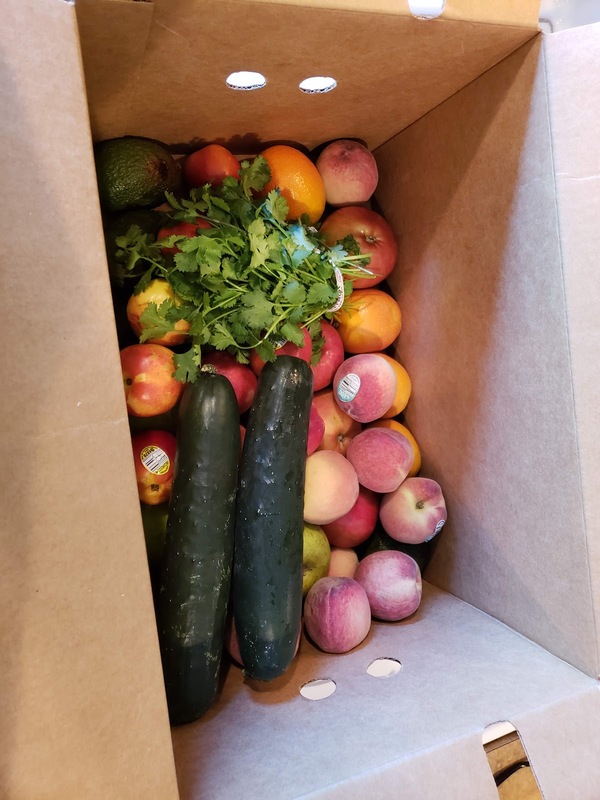 What I love about the whole process is....number one I can skip a week anytime I want and number two I get to customize my box with what I want and how much I want. This was my first box! It was around $20, but with my $10 off it was half that. 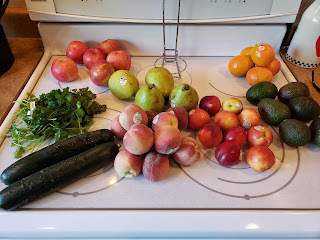 Seriously there is nothing wrong with any of these fruits or veggies. The main thing I've noticed is the produce is smaller than what the grocery store wants. They want people to buy bigger items not smaller since it's priced by weight. 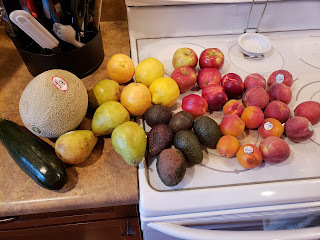 When you are customizing your box some of the produce....say avocados tells you the count you will receive. For this box I order 2 - 3 count of avocado, but for others it's by weight. So I ordered 2 pounds of nectarines. It doesn't matter that they are smaller though because I'm still going to get 2 pounds of fruit. All of this for $20!!! 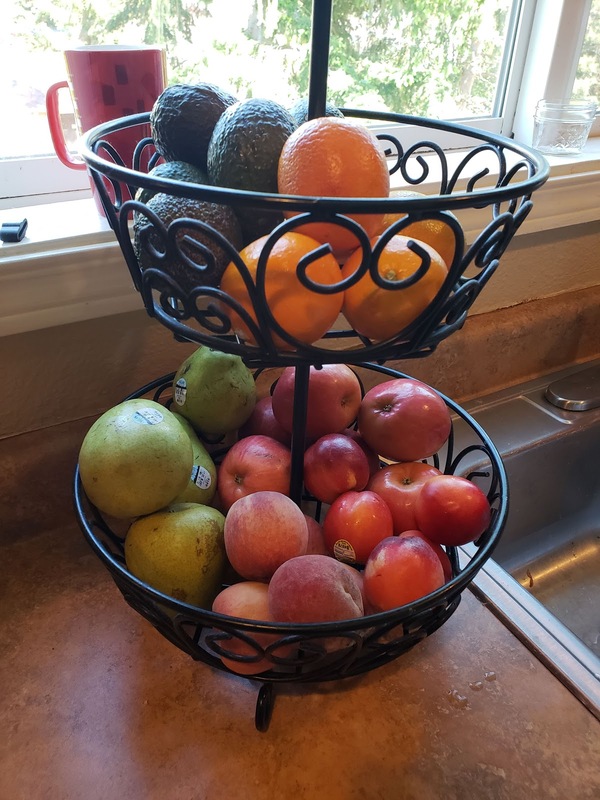 I love seeing my fruit basket full! 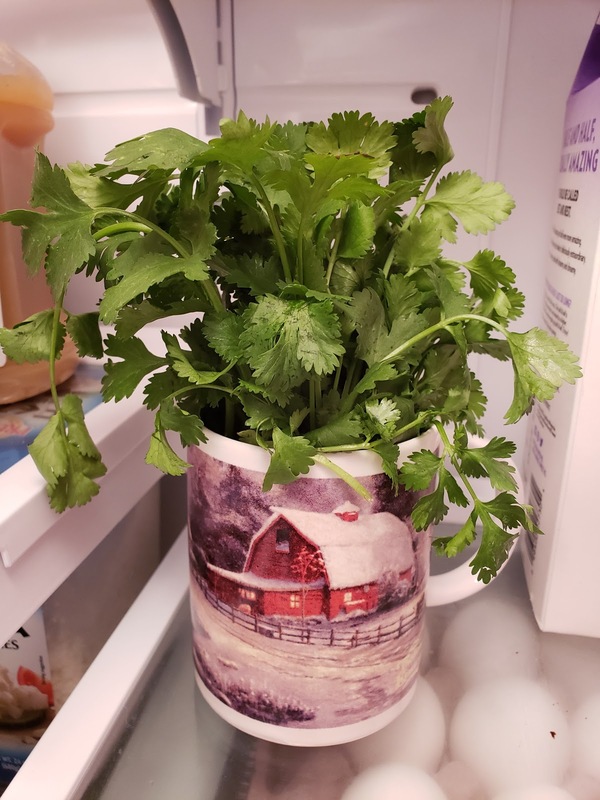 It was so fun that they had cilantro and I just so happened to need it for a recipe and I didn't even have to run to the store. That can be the tricky part of ordering though because you are subject to what's available. You can't count on them having the same thing every time. This is my most recent box....$22!!! 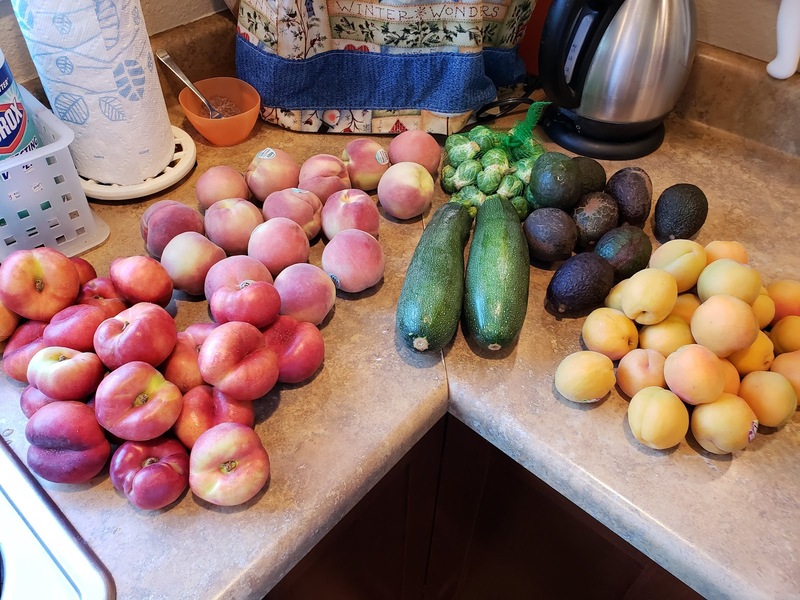 Peaches, nectarines, Brussels sprouts zucchini, avocados and apricots. Yum yum! If you're curious about trying out Imperfect Produce let me know and I'll get you the same $10 off deal that I got.